This is the story of how a ball of pink mohair yarn, a bit of acid dye and a microwave helped me transform some long-forgotten yarn into exactly what I needed to knit the sweater I want. Like many knitters, I have a lot of yarn bought in a fit of love at first sight, only to linger in a box for a few years. I keep telling myself it will all get used. Eventually. 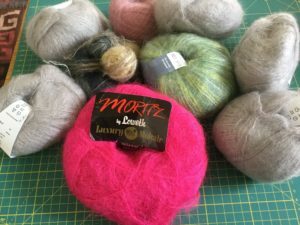 When I was given a ball of hot pink mohair yarn last weekend, I thought: yes, I can use that and I think I have some yarn to go with it. Turns out I had quite a few odd balls of mohair in my stash–green, grey, blue and light pink. I found this pattern on Ravelry and thought, that’s the one. This pattern calls for nine colours. I had five–hot pink, light pink, green, grey and blue. My options were change the colour scheme set out in the pattern or dye the grey yarn I had to create four more colours. Here I made some assumptions. The first was that the fiber content of the grey mohair would take the acid dye. It’s mohair, silk, nylon, polyester and metallic. I also assumed I could get good colours over-dyeing the pale grey yarn. Luckily those assumptions turned out to be correct . However if you want to dye commercial yarn in a colour that might not look nice over-dyed… I would definitely test first. Also make sure to check the fiber content of the yarn. 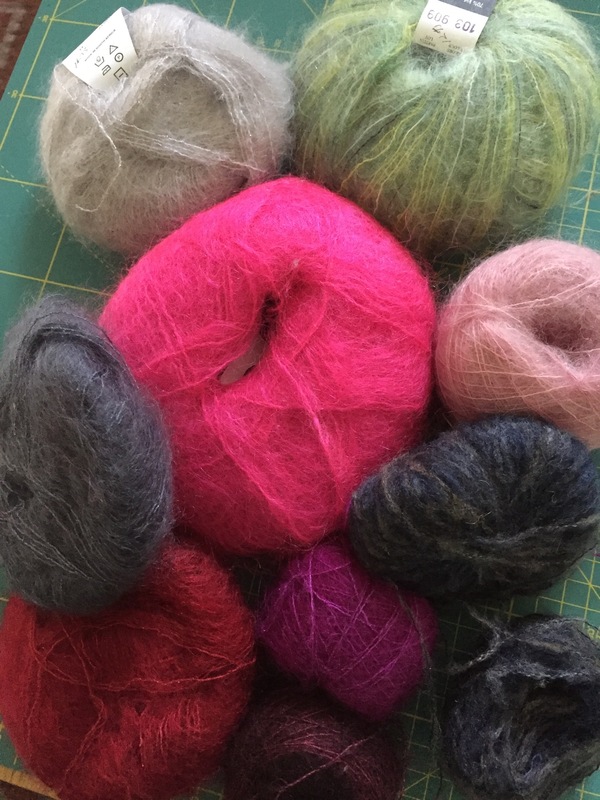 Protein fibers–silk, wool–dye the best with acid dyes. Some synthetics take acid dyes too. Cottons and other plantern-based fibers (bamboo, hemp, linen etc) require different dyes completely. Once I planned out which colours I was going to dye my grey yarn, I got out my microwave (one I use for dyeing), a scale, a ball winder, some glass jars, the dyes and some vinegar. 1. Thinking I wasn’t going to need a full 25g of yarn for every colour, I divided two balls into four using my ball winder and scale. I ended up with four balls roughly 12-13g each. It’s critical not to wind the yarn too tight or the dye won’t penetrate into the yarn closer to the centre of the ball. 2. Soak the yarn in warm water and a bit of white vinegar. Easy does it. You don’t want the yarn to felt or get into a knotted mess. 3. Get your dyes out and prepare them. For small quantities of yarn you will need very little dye powder. I probably used about 1g of dye per 12g ball I dyed. Put the dye in some warm water, stir and add a little vinegar. I used Ashford’s purple and black dyes to get the purple and dark grey colours. For the wine colour I used Jacquard dyes’ russet and a very little Ashford navy blue. For the red I used Jacquard’s fire red. Put the yarn in the dye. Make sure it’s not too crammed in there otherwise the yarn will dye unevenly. Put the jar in the microwave for 2-3 minutes on high. Let it sit for 5 minutes or so, then give it another 2-3 minute blast. Let it sit and cool. If you haven’t overdone it on the dye, the water should be clear and the dye bath exhausted. 4. Carefully rinse the cooled yarn and squeeze out the excess liquid. Now let it dry. I’m pleased with my results. The grey yarn took the dye nicely and the colours are close to the ones used in the sample. Sure they are not identical, but that isn’t an issue for me. Next yarn to be over dyed: the balls and balls of yellow wool my mother gave me a few years ago. Yellow really isn’t my colour, but I’m pretty sure I can make them into something I will like. Your overdyed yarn turned out great! I also have some hot pink mohair, (I guess everyone does?) maybe I’ll dust it off and see what I can make of it.